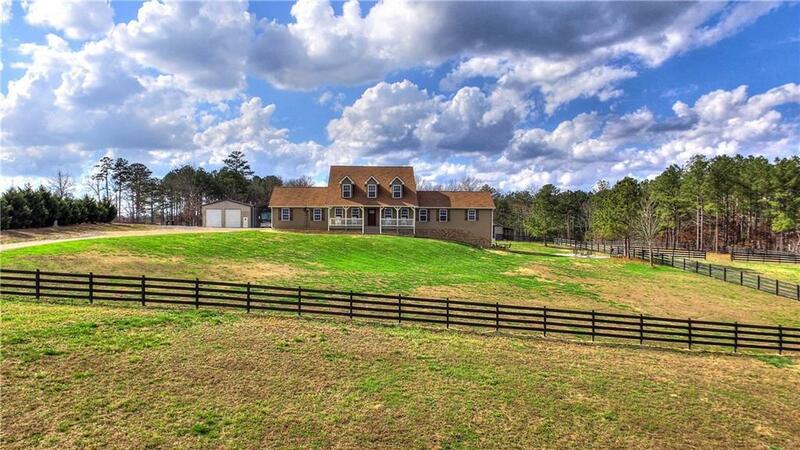 12ac Equestrian estate ready for you & your horses! 3bd/3.5bth home over fully finished basement, grand front porch, 2 offices, 2 story great room, wet bar, theater room, card room & walkout to a wood burning firepit to enjoy cool GA evenings. Main offers half bath & Master Suite w/spacious Master bath w/ jetted soaking tub & large walk-in shower. 2nd level has full bath & 2 large bdrms. 5-stall barn w/ wash stall, tack room, feed rooms & attached lean-to for hay storage. Property completely enclosed, pasture is cross fenced. 3 out-buildings & RV port are also incld!